The IDF's extensive ground incursion in southern Gaza has concluded Tuesday morning, after 24 hours of searches for weapons, tunnels and wanted terror suspects within the Strip. 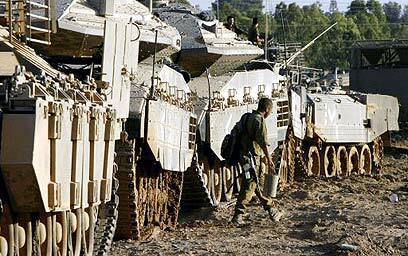 Infantry units, armored corps and engineering corps forces participated in the operation, which took place 2 kilometers inside Gaza. Several Palestinian were detained and transferred for investigation in Israel following the raid. Southern Command officials noted that similar raids will continue to be launched in the future, as part of the army's current method of operation in the Strip. According to army sources, such operations were aimed at providing the IDF with a military advantage in places where the air force was unable to operate. "When ground forces enter Palestinian territory, they can carry out searches, locate operatives and operate in conjunction with the IAF," they explained. "The operations are mostly defensive in nature, and were meant to provide us with the ability to evaluate what goes on there, and along with investigations that are being carried out inside and outside the Palestinian territory – they give us a reliable picture of preparations for terror attacks," the officials added. See all talkbacks "IDF pulls out of Gaza, pledges further operations"